Climbing is growing in America, and when an industry grows, goods and services tend to get homogenized, and the specific, unique history of each commodity forgotten. As climbing walls pop-up in every major city and in flat lands and strip malls, it is easy to forget the days when climbing was just an outdoor niche sport for a select few diehards. But not every climbing gym is ignoring the traditions which preceded the standard settings of gym today. 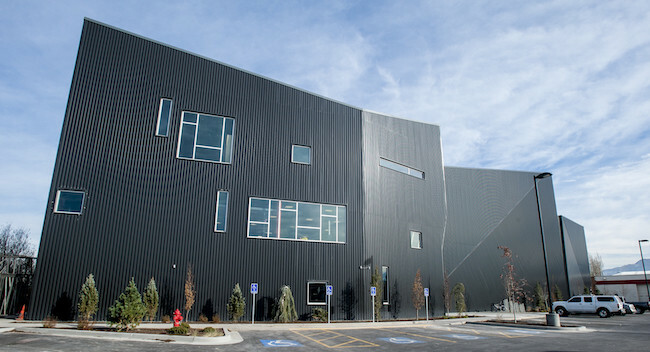 The Front Climbing Club in Salt Lake City and Ogden, Utah, recently completed a major expansion of its Salt Lake City location that more than tripled the facility size and added 70′ tall climbing walls to the original bouldering-only facility; future phases of the project will add dynamic social spaces, including a restaurant and large outdoor courtyard. The design of the facility builds upon the Front’s unique culture that has made it successful for so long. The Front brand was started in 1990 by climber Dave Bell who opened The Wasatch Front Body Shop, nestled in the heart of the outdoor climbing mecca of Utah. The roughly 25-member cooperative was the first climbing facility in Salt Lake City, and it was indeed located in a former auto-body repair garage. “There were still tires on the ground, and climbers walked out with black on their noses,” says Mike Uchitel, former owner of The Front. 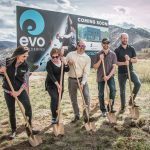 Through a few change of hands, The Body Shop closed and reopened in a new location as The Wasatch Front Climbing Gym. The gym was an upgrade from a glorified car shop with climbing holds, yet Uchitel first purchased The Wasatch Front precisely with the intention of closing it down. The sport of bouldering was growing, and Uchitel wanted to try a bouldering-only gym, a novel idea at the time. In the summer of 2000, Uchitel opened The Front Climbing Club in spectacular fashion, hosting the first bouldering competition of the legendary Professional Climber’s Association (PCA). The $20,000 cash purse attracted roughly 100 of the best names in climbing from all over the world, as well as nearly six times the legal fire code in spectators, with more fans peaking through the windows from the parking lot. Besides managing The Front and guiding the PCA, Uchitel was also partial owner of Pusher, Cordless and S7; businesses which operated just down the street and provided The Front with the latest climbing holds, crash pads and apparel. After working 12-to-16 hours per day, seven days a week, Uchitel was getting burned out. One January evening in 2005 while closing the gym, a member who had climbed there for about two weeks approached him, offering suggestions for how the gym could be run better. Uchitel told the man to buy the gym and implement those changes himself, and he put the keys to the building on the table! A month later, that man, Dustin Buckthal, was the new owner of The Front. In addition to improvements in day-to-day operations, Uchitel also cited Buckthal’s staffing abilities as critical to his successful transformation of The Front into a full-scale climbing gym. “Dustin hires nice people who continue to create that social atmosphere and understand the history of that town and gym,” says Uchitel. As the present owner in the gym’s long lineage, Buckthal is not only investing in a gym but a climbing community with a deep history and a rich culture. It is this culture which guided The Front expansion, an addition intentionally designed to account for the outdoor cragging and tight-knit community of the authentic climbing lifestyle sought by its members. 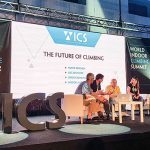 The traditional perspective on commercial climbing gym success suggests a strong, positive correlation exists between climbing surface area and profit. 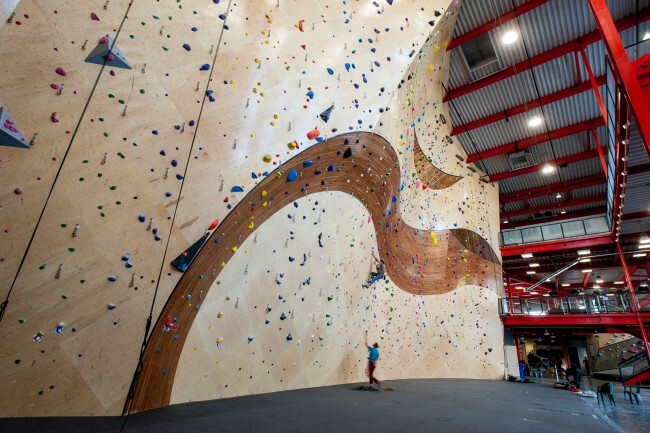 While maximizing climbing area may increase revenues at some gyms, Buckthal had a more progressive idea in mind for The Front expansion which emphasizes allocation of space for purposes other than climbing. To design and build a social space with an outdoorsy feel, Buckthal teamed up with a talented team of experts who were no strangers to the surrounding climbing community: contractor Mike Menlove, owner of Menlove Construction and father of Salt-Lake-born rock climber Portia Menlove; longtime Front member and skilled architect Hannah Vaughn, now with the architecture firm MHTN; and of course climbing wall manufacturer Vertical Solutions of which Buckthal is co-owner. Partnering with a dedicated local team created internal perseverance to withstand project setbacks and united the brains and tools necessary to reconstruct a very particular gym environment. Upon entering the gym, the first area seen is the extensive retail shop. Since gym climbers investing in living the climbing lifestyle need a handy place to buy gear for indoor and outdoor excursions, The Front has invested heavily into retail at both its Ogden and Salt Lake locations. 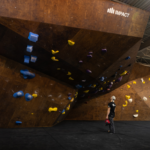 Past the merchandise and front desk, geometrically designed bouldering walls and curvy route climbing walls that rise up to a whopping 70 feet dominate the main stage. Bathrooms have showers, lockers, and – within the next few weeks – saunas. For a climbing gym to meet all the fitness needs of the modern climber, resources must be provided which supplement climbing walls with additional equipment for a comprehensive workout routine. That is why Buckthal devoted the entire second floor of the expansion to training. Free weights, cardio machines, hangboards and 20, 30 and 45-degree walls adorn the second floor. This pump zone is a gym within a gym, only one with scenic views of the Wasatch Front and Oquirrh mountains. Although interior construction is just beginning, the third floor will fulfill most of the social goals of the expansion. Besides executive offices, the top floor will also host three wooden floor studios for pilates, yoga and spin classes, as well as a climbing space for instruction, beginners and groups. The highlight of the third floor, however, will be a restaurant and communal lounge which will overlook the route area. This social space will be outfitted with comfortable chairs and tables for members to relax, do work, answer emails and converse with one another while enjoying a cozy meal and drink. Typically, climbing gym restaurants have not seen much success. Gyms may offer a few snacks, but the vast majority leave dining to the professionals. A menu of “evening eating” at The Front comprising beer, wine and shareable post-workout foods may yet buck the trend. For Buckthal, though, another revenue stream is not the goal. 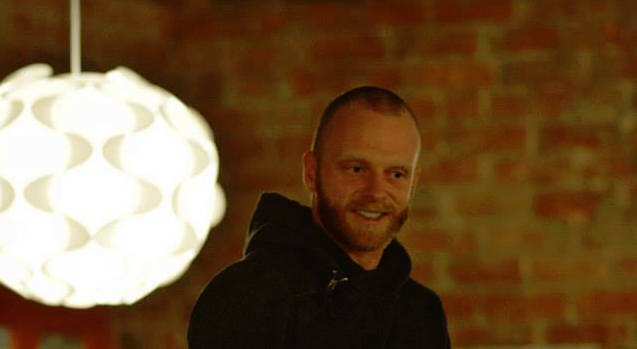 Regardless of profit, the cafe plays a role in the overall goal of the expansion. While the Front’s bouldering walls in the original facility have been left intact, the former space has been remodeled for individualized and group fitness programs. They have teamed up with Massif Athletics to offer personalized training programs for “climbers, mountain athletes, and anyone looking to elevate and achieve their fitness goals”. 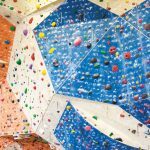 Indoor climbers have different training agendas and varying athletic interests, from general fitness to a range of outdoor sports like rock climbing and mountain biking. This training area will enable all attendees of The Front to better define and realize their personal goals. In addition to waterless urinals, glass and plastics recycling and clothes donations to Big Brothers, Big Sisters, The Front relies on renewable energy sources to power its gym. In 2010, a federal grant and Rocky Mountain Power helped fund the installation of a solar system, and these solar panels account for roughly 20 percent of the facility’s energy needs. To cover the remaining 80 percent, The Front participates in a Rocky Mountain program called Blue Sky which funds alternative energy products, primarily wind power. Additionally, both facilities are cooled by Swamp Coolers. More popular in dry climates, these machines contain a fan which cycles hot air through a water-soaked membrane. The water evaporates and, in so doing, absorbs some of the heat from the hot air. Swamp Coolers slightly increase the humidity of the dry Salt Lake City facility, can drop the room temperature by 30 degrees, and they drain less power than typical air conditioning systems. Flutes in the walls also enable hot air to rise before entering the interior, and windows are few on the west and south sides which receive the brunt of daytime sunlight. Perhaps the most intriguing aspect of the Front’s expansion is what lies in the 15,000 square-foot courtyard between the new expansion and the original bouldering facility. Still a long-term project, the planned green space will eventually include water features, vertical and box gardening for use in the cafe, outdoor event space and some outdoor boulders for gym goers looking for a breath of fresh air. For those members who remain inside but still pine for the great outdoors, a plethora of windows and roll-up doors are oriented to maximize green space viewing. Special thanks to Kaleigh Malinowski, Marketing Coordinator of The Front, for assistance with The Front’s history. 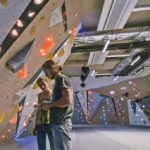 Gym Rush Hits LA Market The Climbing Gym Rush Hits Canada Philly Is So Hot!